What do you do when you’ve sold the most expensive work by a Contemporary artist? You find another one to sell. Only in today’s art market would a $16 million painting be seen as an after thought. But big sales are meant to re-structure the entire market for an artist’s work. 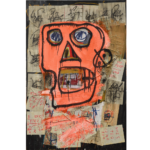 Sotheby’s recent success with Bacon–not just the $86 million record price but the whole run up of $50 million records and strong prices for works like the $33 million self-portrait (said to have been bought by Damien Hirst)–continues to bring out more pictures. Christie’s has certainly shared in this bounty but Sotheby’s has been much more aggressive in making a market for Bacon’s work. Thus we get immediate news of another Bacon to be sold at the next round of Contemporary auctions. A portrait of George Dyer, one of the more sought after subjects by the painter will be offered in Sotheby’s July 1 sale in London. The painting is estimated in excess of $16 million. The New York Times wants you to know that “When an artist’s works begin fetching astronomical prices, other works by him or her will almost inevitably, and immediately, come to auction.” Which is true but the Triptych sold in New York last week represents the crescendo in that process, not the prelude. In 2007, $267 million worth of Bacon paintings were sold in the evening auctions; so far in 2008, that number is $167 million but half the value came from one work.